Beautiful little cabin! Great views and a nice hot tub, shared firepit, and community area. Seriously well equipt for an outdoor adventure. This cozy cabin as all of the things youll need to hike around Winthrop on a cool autumn day. We went hiking in the mornings, visited Winthrop in the afternoon, and enjoyed ping pong, the fire pit, hot tub, and cozy cabin in the evening. Overall, this was perfect for our Thanksgiving gathering. We had a wonderful time at the cabin. Lots to do between hiking, swimming, hot tubbing, volleyball, and badminton. Heading into town to check out all the stores and great restaurants was entertaining as well. The cabin was very spacious and was stocked with all you need minus the groceries. Plenty of games and also wifi connection and TV viewing. I cant say enough about this wonderful place and cant wait to go back. We are thinking of making this an annual event. My boyfriend and I really loved our stay at the Sleeping Wolf Large Studio. The place is very clean and cozy with enough room for 2 people. Theres a small balcony overlooking a big grassy area, volleyball courts, and it was nice to get some fresh air without having to walk outside. The hot tub on the property was a great way to unwind, and if we were there longer we definitely would have made use of the pool and ping pong table. Its about a 13 minute drive from downtown Winthrop, so going back and forth from the property to town wasnt bad at all. Check-out procedures were super easy and we barely had to do anything, so it was a really quick and easy time getting back on the road the morning we left. I will absolutely be coming back here! Great experience. This cabin was AMAZING! Great space for cooking dinner and hanging out after a day of hiking. A lovely and quiet setting in the valley with lots of private nooks along the river where we had dinner one night, and acres of wide open space for running around with the dog. The cabin itself was well stocked, clean, and cozy. We used the common amenities as well - ping pong, hot tub, fire pit. Its now our new favorite place to stay in Winthrop and well be back. Wolf Ridge was beautifully situated and very close to the town of Winthrop. Everything was easily coordinated, and it was a great place to spend the weekend. So much beautiful nature around. Great house! Having 3 bedrooms made it perfect for us 3 couples to have our own space. Great kitchen to cook in! Never used the "community pool" but it was nice to know it was there if we wanted to. This spot was great for a short weekend ski getaway. 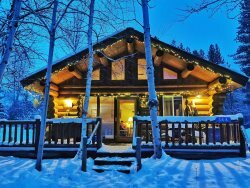 The cabin is right on the community ski trail and is just a serene location near the river. Skiing out the front door is hard to beat. It is also not too far of a drive into Winthrop. The cabin itself is pretty no frills but very comfortable. The beds were good, the kitchen was well stocked, and the gas fireplace warmed the place right up. Would stay here again! We stayed here as a stopover on our way to ski in Canada. The cabin was just what we needed. Cozy & quiet. The cabin was a welcome sight for our motorcycle journey. The temps were over 100 degrees the weekend we stayed. The cabin was clean and inviting. Very comfortable. Very cute "condo". The surrounding was beautiful and peaceful. Hope to get back in the winter for a full weekend. Great place to chill and relax with our 4-legged child! I believe this is our 16th year staying with you, our third in Lone Wolf cabin. Looking forward to it! Located about 5 miles north of Winthrop right on the Methow Valley ski trail -- hilly trail to the north and flat trail to the south. Easy drive to other starting points for skiing. We skied directly from the cabin the first day, and went to Mazama and Sun Mountain on other days. We had two families combining a downstairs unit (bedroom, bath and large kitchen/dining/living room) and an upstairs unit (bedroom with kitchenette and bath). Love the beautiful pine log walls and furniture. We cooked and ate together in the downstairs unit. Our units were very well appointed with furniture and kitchen items and were clean. I think the buildings in the complex have different owners, so the quality of the appliances and kitchen items probably vary. Cell phone worked, wifi worked about 90% of the time. We have stayed here many times over the years. Our unit has always been clean, and looks like some exterior maintenance was performed recently. No complaints in that regard. We absolutely did enjoy our stay. We love the place and if I can swing it and theres more snow, well be back again this year. We had a wonderful time and look forward to the future when we can stay at Wolf Ridge again! I had the good fortune the first time to come here during the Perseid Meteor showers in July. I had never before seen them and I was blown away. Because of the remoteness from major population centers, you can actually see this spectacular sight (when Earth passes through this meteor belt). I happened to look out the window at night to admire the starry sky, and saw shooting stars coming down one after the other. Unbelievable! Hey! New website! Looks good! We hadnt been up there for a couple of years and it was like coming home! Our room was so nice and we were glad to see everything is being well maintained. It was nice seeing you. We loved our experience so much that we have already booked for next 4th of July, and are bringing more friends!